While the noise in your workplace may seem like a harmless aspect of the job, the findings of this study support the claim that it may be more harmful to your health than you think. A recent study conducted by the National Institute for Occupational Safety and Health (NIOSH) and Health unveils a new link between noise pollution, hearing loss, and health risks such as high cholesterol and high blood pressure. A division of the Centers for Disease Control and Prevention, NIOSH centers the study on noise in the workplace in relation to these risks, particularly high volume sounds in noise pollution. While the noise in your workplace may seem like a harmless aspect of the job, the findings of this study support the claim that it may be more harmful to your health than you think. In addition to the correlations between these health risks, hearing loss, and noise in the workplace, NIOSH also reported that 41 million individuals, which equates to nearly a quarter of the American workforce, confirmed a significant amount of noise exposure on the job. Although it may seem like an obvious point that ongoing exposure to loud noises from daily television use and music in earphones can contribute to hearing loss, some of the most surprising connections in this study were those between the health risks connected to noise pollution and heart disease, which is a leading cause of death for many Americans. One of the main links between noise pollution and its harmful effects on the body is stress, as constant loud sounds trigger the continued release of cortisol, which can be especially damaging to blood vessels and the heart over time. While the health risks posed by noise pollution are concerning, there is no need to silence all sounds in your workplace. Along with the caveats shown in this study, the CDC and NIOSH add that noises 85 decibels or higher are the only ones that pose a threat to real threat to your health or hearing. 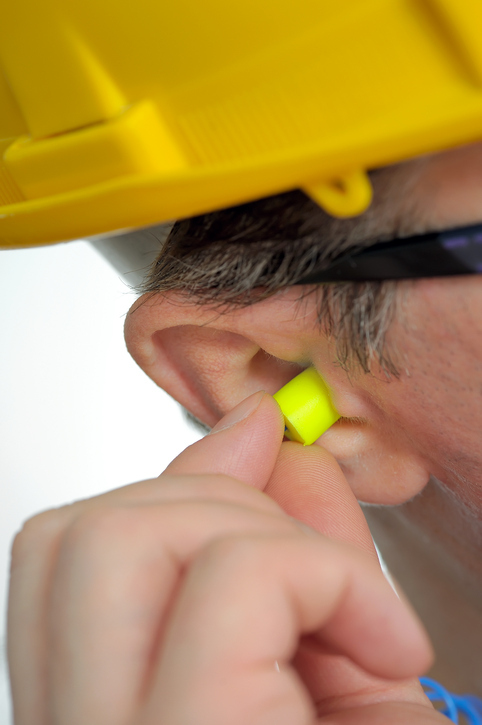 If you can’t avoid the loud noise in your workplace, it is recommended that you utilize hearing protection, such as earplugs, to prevent hearing loss over time. If your workplace is a little too loud, consider asking your audiologist about hearing protection and monitoring your hearing loss in order to stay ahead of any additional health risks that may be associated with your working conditions. By understanding the volume of your work conditions and daily sound exposure, your doctor can make the proper recommendations to help you prevent hearing loss in the future. Need help with your hearing? Clarity Hearing can help. Clarity Audiology & Hearing Solutions is an independently-owned and operated clinic that focuses on quality of care and personalized friendly service. Our Doctors of Audiology are highly trained with advanced degrees and take the time to provide the personalized care and attention that you need and deserve. We provide advanced hearing aid options that personally calibrated with cutting-edge digital technology to fit your hearing loss, your unique ear anatomy, and your individual listening needs. Come in for a walk-in appointment on Tuesdays & Fridays from 10:00am to 11:30am, or contact us to schedule an appointment by calling 410-698-6594 or visiting our contact page. Follow us on Facebook, Twitter, Pinterest, Google+, and LinkedIn for more blog posts, news, and updates! This entry was posted on Friday, April 6th, 2018 at 2:02 pm. Both comments and pings are currently closed.